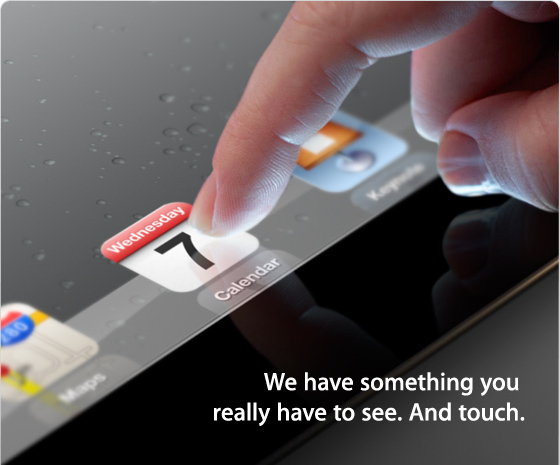 It appears that the iPad depicted in the iPad event invitation does not have a home button. The tell tale indicator is the cluster of six bubbles above the Keynote icon. This set of bubbles is only viewable in portrait mode and, when there are five icons in the dock, sits right above the icon on the far right side. That means that the home button would be underneath the Google Maps icon, but it’s no where to be seen in this image. There have been rumors of Apple removing the home button from their iOS devices but I didn’t think that they would make the change so soon, or at all. It is still very possible that Apple made changes to the spacing of the icons when in landscape mode and/or changed the default background on the iPad. This isn’t entirely out of the question as the new Retina display would encourage Apple to make changes to the wallpaper in order to make better use of the increased pixel density. There’s also the possibility that this image is heavily photoshopped and the designer made the decision to remove the home button to make the design of the device look cleaner, rather than have half of the home button visible in the image. Luckily we won’t have to wait too long to find out, we’re just nine days away from the announcement and I can’t wait to see what Apple has in store.